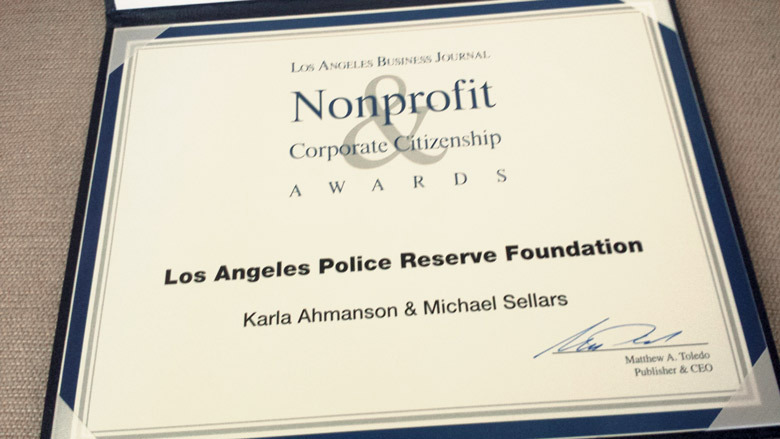 We would like to thank the Los Angeles Business Journal and Publisher and CEO Matthew A. Toledo for the nomination of our Foundation for this year’s Nonprofit and Corporate Citizenship Awards. As the LABJ stated: “We will honor those professionals and organizations that continue to make a positive impact on the community and do so under difficult financial constraints. Equally as important are the efforts of the corporations supporting these nonprofits.” The event was held on June 22 at the Millennium Biltmore Hotel in downtown Los Angeles. We are honored to have received this recognition, and we congratulate all the nominees and finalists. It is our ongoing mission to support and tell the story of our LAPD reserve police officers. We want to thank Rob Hollman at Rosinante Group Advisors, LLC, for helping us to reach out to our city’s business community.